This affordable solar filter fits any Orion 50mm finder scope, so you can accurately aim your telescope (which also needs to have a protective solar filter installed) at the Sun with proper protection. 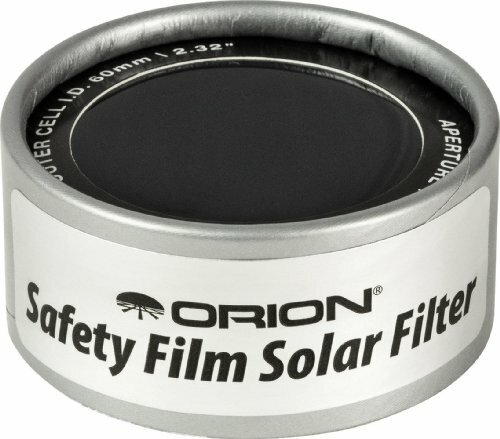 The Orion 2.32" ID E-Series Safety Film Solar Filter features a black-polymer film material that is stronger and more durable than other film solar filters. On top of increased durability, the black-polymer material display the Sun in a pleasing, yellow-orange color unlike the white or especially unnatural blue shade cast by some other filters. You'll enjoy high-contrast, clear images of the Sun through finder scope so you can precisely aim your filter-equipped telescope at sunspot groups and more. A strip of adhesive-backed felt is included to help ensure a secure friction-fit of the filter. CAUTION: Never look at the Sun, either directly or through a telescope, without a professionally made protective solar filter installed that completely covers the front of the instrument, or permanent eye damage could result.